This example models the selling price of a house as a function of several covariates. One of these covariates is a classification variable that indicates whether a house is located on a corner lot (called a corner house in this example). Because corner houses are relatively rare, the inclusion of this classification effect in the model introduces a low-dimensional structure (that is, the majority of the observations are located in a lower dimensional hyperplane defined by being non-corner houses) into the design matrix. As discussed in Robust Distance, the presence of this low dimensional structure causes difficulties in the traditional computation of robust distances. 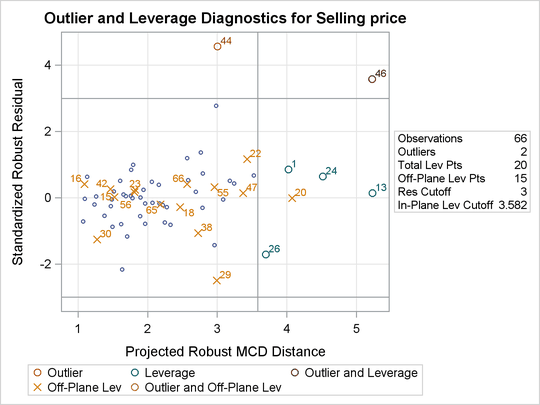 This example illustrates how you can use the projected robust distance to address those difficulties and to obtain meaningful leverage diagnostics. 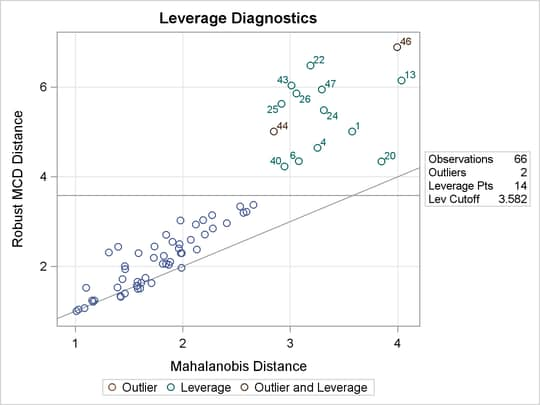 It also shows how you can use the RDPLOT= and DDPLOT= options to illustrate the outlier-leverage relationship. The following house price data set contains 66 home resale records on seven variables from February 15 to April 30, 1993 (Data and Story Library, 2005). The records are randomly selected from the database maintained by the Albuquerque Board of Realtors. label price = "Selling price"
sqft  = "Square feet of living space"
age   = "Age of home in year"
compactor, dryer, handicap fit, cable TV access)"
ne    = "Located in northeast sector of city (1) or not (0)"
cor   = "Corner location (1) or not (0)"
To illustrate the dependence detection ability of the generalized MCD algorithm, an extra variable sum is created such that all the observations satisfy sum = sqft + age + feats + ne + cor + tax. Adding sum does not change the rank of the original design matrix, so that sum is expected to be ignored in the model and also in the diagnostics. The next statements apply the MM method and the generalized MCD algorithm to the house price data. As shown in Output 80.5.1 and Output 80.5.2, PROC ROBUSTREG finds the design dependence equation and forces the parameter estimate of variable sum to be zero. Note: The following variables have been ignored in the MCD computation because of linear dependence. Moreover, PROC ROBUSTREG also identifies a robust dependence equation on cor in Output 80.5.3, which holds for 77.27% of the observations but not for the entire data set. Note: The following robust dependence equations simultaneously hold for 77.27% of the observations in the data set. The breakdown setting for the MCD algorithm is 22.73%. Another way to represent the low-dimensional structure is to specify the coefficients of the MCD-dropped components on the data (see Output 80.5.4), which form a basis of the complementary space to the relevant low-dimensional hyperplane. 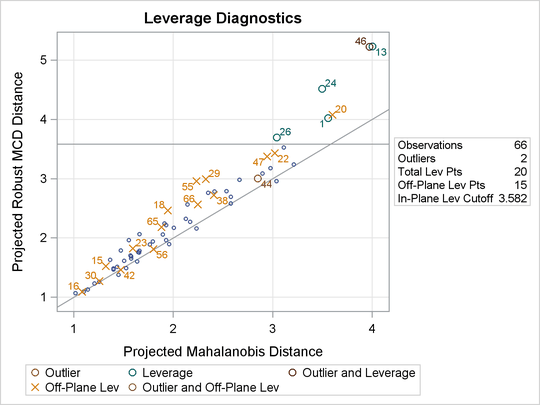 By the definitions of projected robust distance and leverage point, an observation is called an off-plane leverage point if at least one of the robust or design dependence equations does not apply to the observation. In this example, the observations with cor = 1 are all off-plane leverage points. Output 80.5.5 lists the leverage points and outliers along with the relevant distance measurements and standardized residuals. From Output 80.5.6 and Output 80.5.7, you can see that there is no apparent corner-related difference for the houses in terms of standardized robust residual and projected MD versus projected RD, although all the corner houses are defined as off-plane leverage points. Output 80.5.8 shows more details of the robust diagnostics. The number of dimensions indicates that six regressors are used in the MCD analysis. Since sum is excluded in model fitting, it is ignored in the MCD analysis. The number of robust dropped components equals 1 due to cor. The number of off-plane points implies the 15 corner-house observations. 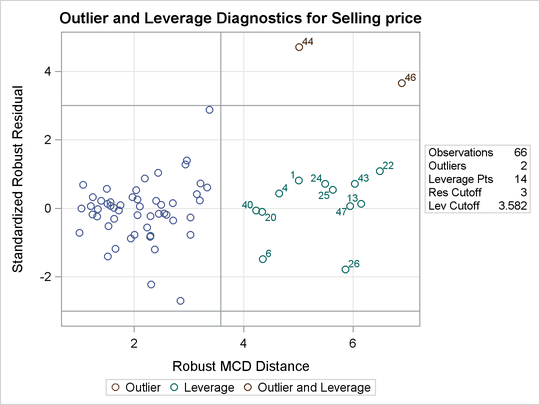 The reweighted value of H is the number of observations that are finally used to estimate the MCD covariance. Compared with Output 80.5.8, Output 80.5.11 shows the changes of the MCD information by removing cor from the model. You can see that the corner houses are no longer identified as off-plane points and the reweighted value of H is increased from 47 to 52. The breakdown value is intact because it depends only on the specified value of H and the total number of observations.